This easy Healthy Avocado Dip recipe is rich, creamy, and takes only 5 minutes to make! It makes a tasty appetizer or snack that everyone is going to love. If you are in need a last-minute party appetizer or snack, this creamy, dreamy dip is your answer. It is a delicious alternative to guacamole or salsa and pairs perfectly with tortilla chips or fresh chopped vegetables. I love making this dip because it is so much better for you than most store-bought creamy dips. Avocado provides a healthy dose of good fats, while the Greek yogurt gives it a creamy texture without the use of mayonnaise or sour cream. Not only is this dip nourishing, it is also a breeze to whip up. You basically toss all your ingredients into a food processor or blender, season with a little S & P and you are good to go. Tip: To make the dip look extra pretty if you are entertaining, swirl the top with the back of a spoon, then drizzle with extra olive oil and sprinkle with more chopped fresh cilantro, crushed red chili pepper flakes and/or freshly ground black pepper. Food Processor – This is the one I use and love! I have had mine for years and it is one of my favorite kitchen tools. I use it all the time to quickly combine ingredients and to make sauces and dips. 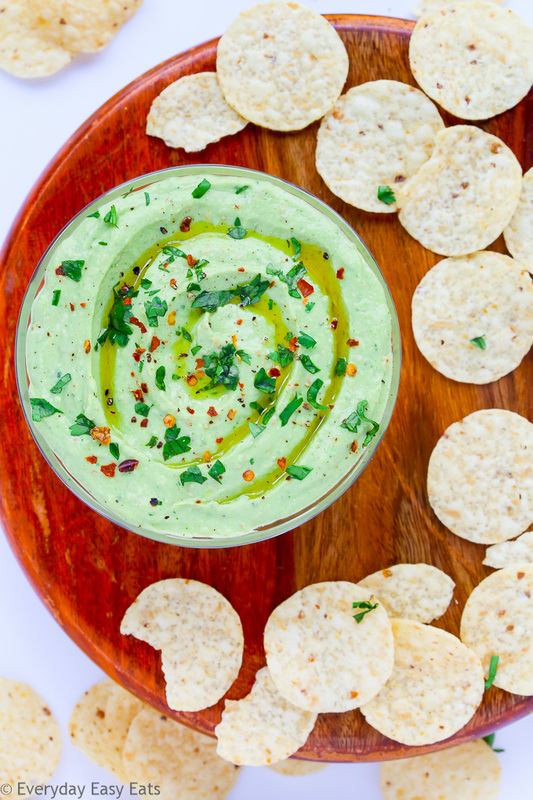 This Healthy Avocado Dip is perfect for entertaining or snacking. Serve with tortilla chips or fresh chopped vegetables. Process/blend until smooth. Season with salt and pepper to taste. Serve with tortilla chips or fresh chopped vegetables. We make this all the time now – It’s fantastic, easy and turns out perfect every time! That’s great! Thanks so much Beth!